The Hydra-Cell T100 is now available with corrosion-resistant 316L stainless steel pump heads. US industrial pump manufacturer, Wanner Engineering, has announced that its Hydra-Cell T100 series high pressure pumps are now available with corrosion-resistant 316L stainless steel pump heads. The company said this is a significant upgrade and it has also introduced an expanded choice of diaphragm materials, valve materials, and actuating oils for the pump to expand its capability to handle more applications in the chemical processing industries. With flow rates up to 26 gpm (98 l/min; 891 BPD) and discharge pressures to 5000 psi (345 bar) the T100 is designed for a variety of applications including salt water disposal (SWD), salt water injection, bulk transfer and hydraulic lift in oil fields, as well as steam generation, Reverse Osmosis in water and wastewater treatment, and mine dewatering. Hydra-Cell T100 series triplex pumps are designed to replace horizontal centrifugal pumps and packed plunger pumps in oil and gas applications. They feature a seal-less, multiple-diaphragm design and eliminate hazardous VOC emissions. In addition to zero leakage, T100 series pumps are able to run dry without damage, operate with a closed or blocked suction line, and pump hot abrasive fluids. The metering pump from Wanner could handle the low flow metering in a variety of applications. 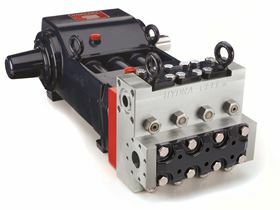 Pump designer and manufacturer, Wanner International, has recently launched the Hydra-Cell Q series of high horsepower quintuplex diaphragm pumps. A look at the factors to take into account when choosing the proper diaphragm that will be suitable for a specific application. The new range offers a wider choice from a single supplier. Columbus, Ohio-headquartered OTC distributes highly engineered products including pumps.